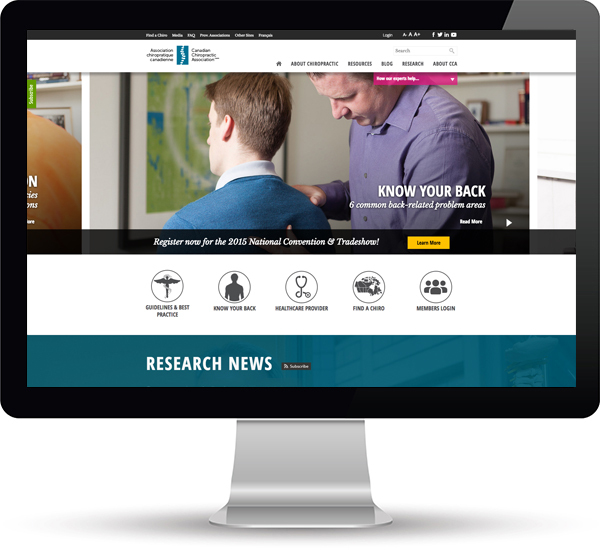 The Canadian Chiropractic Association (CCA) is a national, voluntary association representing Canada’s licensed chiropractic doctors and its 10 provincial charter members. CCA’s mission is to provide inspired leadership to their members, provincial stakeholders, their fellow healthcare professionals, their employees and volunteers, their Canadian and international partners and the Canadian public. CCA’s vision is that chiropractors become an integral part of every Canadian’s healthcare team by 2023. We were engaged to help with the digital transformation of the organization, working closely with the leadership to define, support, and drive transformation. Our initial engagements were strategic, facilitating discussion between the CCA and the provincial associations to define the brand in the eyes of multiple external stakeholders. Later, we developed a new visual identity (and logo) that supported the vision, which was adopted nationally and by most of the provincial associations. We replaced an aging association management system with a sophisticated marketing automation/CRM system, and trained all internal departments on using the system for marketing and communications, member engagement, advocacy, and billings. We developed an extensive AODA-compliant website that was powered by the CRM system, and contained a robust members-only area, including an area where members are able to self-manage their profiles, where provinces could privately share resources, and where the board could privately conduct its business. The website also includes the complete Chiropractic Best Practice Guidelines: the definitive source of evidence-based clinical practice guidelines for Chiropractors. The website also features Find a Chiro functionality that integrates the membership directory and Google Maps into the website. Our team developed the Social Media strategy, and delivered a comprehensive community management training program for CCA resources. Finally, we developed the multilingual Straighten Up Canada App, available for iOS, Android, and BlackBerry. This app encourages Canadians to improve their posture, learn more about back health, and to connect with a local Chiropractor. Beyond increased website traffic, a common national identity, and technology that supports (and amplifies) the vision of the board, the website and systems have improved internal efficiency, increased member engagement, and have directly improved engagement with key stakeholder groups. The CCA manages the entire system on their own.